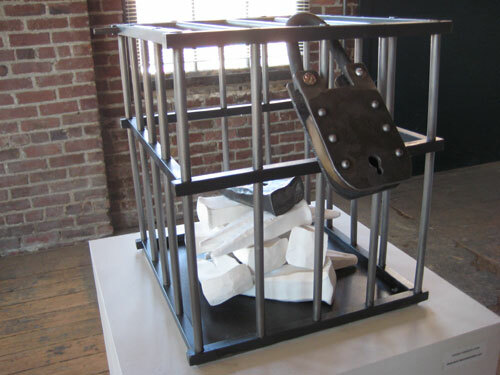 Dan Corson‘s Spatial Matrix. 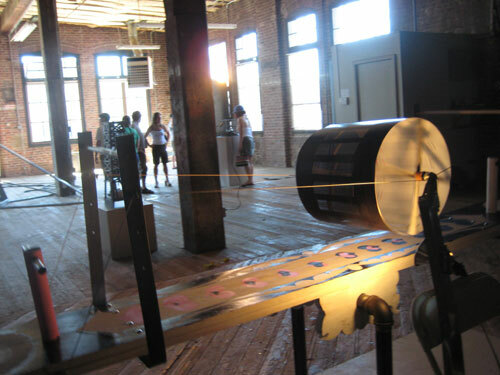 Spatial matrixes are nothing new — I saw one at another gallery just a couple days ago — but this one is a little unique. 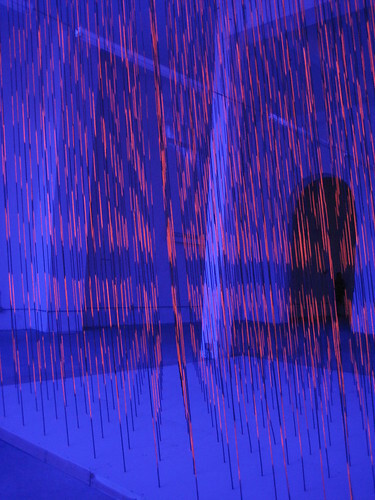 It was an installation at the Georgetown brewery’s former “Engine Room”; clear indigo panels were put up over the windows, and steel cables ran from the ceiling to the floor, with neon stripes painted on them. The result looks is cables that almost look as though they are trembling. Head on over to Dan’s website to see more works. 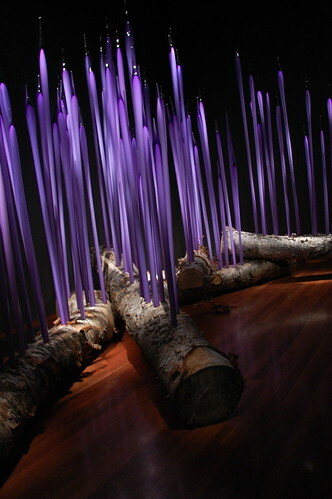 Although I’ve never known Dan’s name, I have seen his works throughout the city of Seattle, and his installations are actually quite commonplace throughout the city. Go take a look; you might be surprised, too. 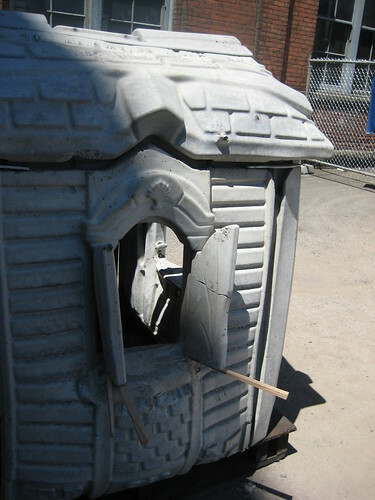 A playhouse encased in concrete? Artist unknown. Updated version, courtesy of Jeanine Anderson! I’m sad to say that this was my first year attending Artopia in Seattle’s Georgetown neighborhood, but I now wholeheartedly back the event, which is full of shenanigans, music, and of course, art. 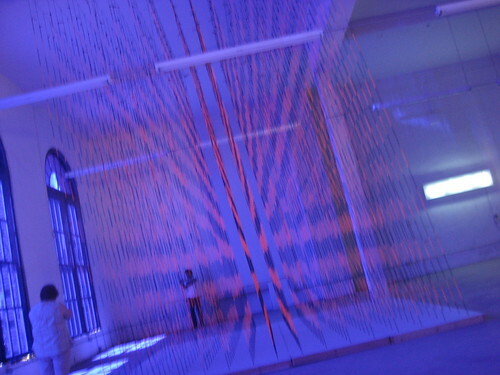 And to my pleasant surprise, a lot of installation art — which is relatively lacking in Seattle. To the unacquainted, Georgetown is a relatively “rundown” part of the city, but in a good way. It’s chock full of antiques and old-school personality. With portions of an old brewery and malt plant still intact, the neighborhood has established itself as a pretty good art niche as of late. Upon first getting there, we were met with crafts to do. Carve your own clay tile, they said. Partake in our creature swaps, they said. Eat free popcorn, they said. Play in our strongman competitions, they said. But that was just the beginning! 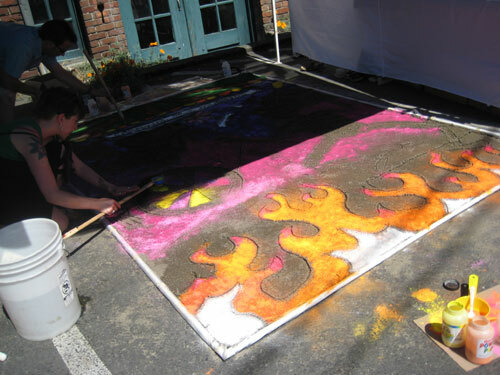 Sand painting, with powdered paint. Powdered paint?!! 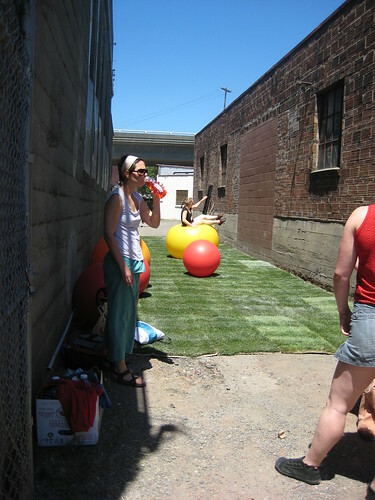 Yoga ball alley does a body good. How do they come up with this stuff? 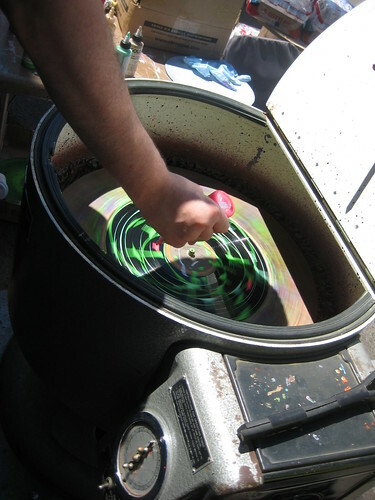 Numerous colored paints, one record, and one centrifuge = spin art. An experimental film setup of sorts. 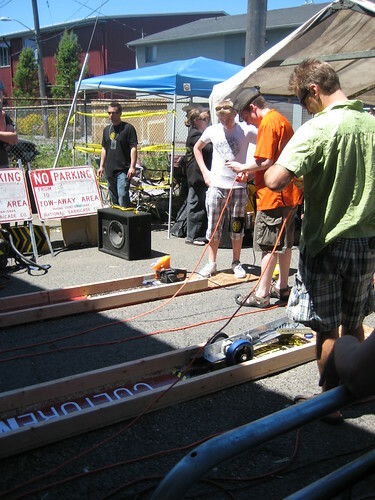 A contraption that’s a little like a seesaw, but when you stand on the end, it’s similar to a flipbook. You think about that. Jethaniel “Spyder” Peterka‘s Anatomical Icons. Oil on panel and what looks like gold leaf. He was a former (or current?) Gage Academy of Art student. I know nothing more. If you are in London.. it’s China Design Now! What can I say? Amazing. I have been meaning to check out this exhibition ever since March but just haven’t had the excuse to get into London before now.. and I wasn’t disappointed when I finally got there. Ji Ji’s other works are also on display in the next room; Where the exhibition then moves on to Shanghai, a city which has recently exploded where shopping, dining and building development are concerned.. and this is very evident. The room is bursting with advertising and consumer design, from clothes to magazines.. This is where Ji Ji’s ever popular t-shirts in China by the design studio; Shirtflag are on display. The designs on the t-shirts combine many of the recognizable propaganda images with smooth contemporary design making for very desirable clothing. Another notable part of this section of the exhibition are the Nike trainers on display, something I wouldn’t have expected despite the consumer theme. The final part of the exhibition is Beijing, a room which boasts the sudden push in recent years of china’s architectural design. Playing host to the 2008 Olympic Games, Beijing has grown at lightening speed and this is very apparent. There are models on display of recent developments within the city including the current development of Beijings National Swimming Center that somewhat reminds me of the Eden project with its bubble like appearance. 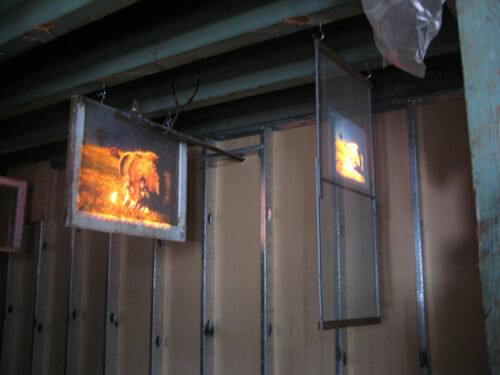 There is also a walk in installation consisting of three screens which create a very realistic feel when watching the animation on show. Before you is a depiction of the future city with its new developments.. it looks really impressive I must say. As a summary this exhibition was a real eye opener. After only a few years China has developed at an unstoppable speed in the way of new and interesting innervating design. This was an exhibition well worth seeing… I would say any exhibition that captures something so amazing as the recent developments in a whole country is well worth seeing! So if you can… get on over. It’s beautiful. So there you have it.. Hopefully this has been an insightful post! And with any luck I will be back again! Upcoming Events: Blaine Fontana and Lucklusters! Originally from the Pacific Northwest but now residing in Southern California, Blaine Fontana is the favorite of many skate-related brands. He has a couple books that have been printed by Upper Playground and, as the owner of one, I must say that they are wholly worth the money. In this case, Vans has brought Blaine Fontana to Seattle for a book signing at the skate and snow shop, Snowboard Connection. See the unveiling of a new mural and partake in a book signing! 263 Yale Ave. N, Seattle, WA. A time at Seattle’s possibly newest venue, King Cobra, is always a good time. For $3.00, you can witness live paintings by favorite Seattle street artists, PGEE!, Ego, Brennan Coyle, Parskid, 2H, 179, and Daner! Hip-hop music by DJ Sean Cee. 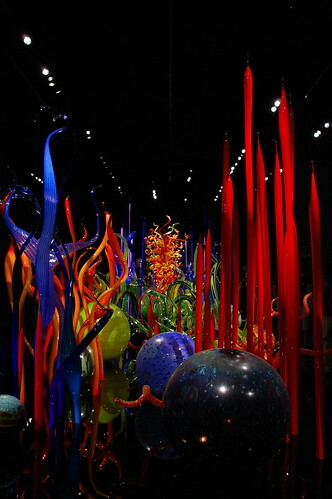 Dale Chihuly is from Seattle, and as a result, his works are seen fairly often around the Pacific Northwest. 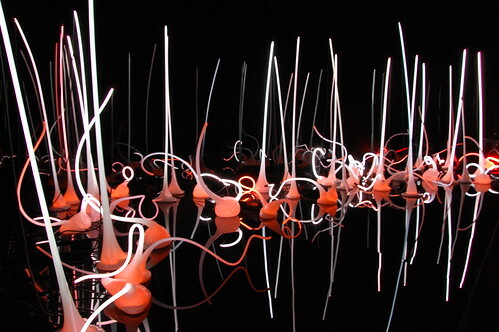 To first time viewers, Chihuly’s works are striking and eye-catching… to those who have seen many of his pieces, however, the lack of diversity becomes a little stifling. 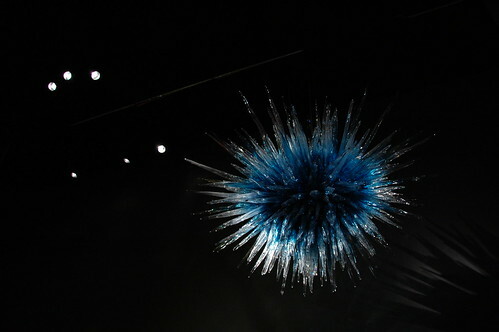 To my pleasant surprise, however, due to creative installation trickery and fancy lighting, the exhibit was amazing (and yes, well worth the $5). 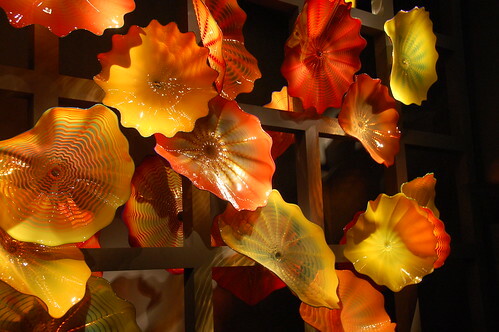 Chihuly’s glassworks made a showing, of course, but his sketches and drawings did as well. Personally I found them to be less eye-catching, but I’m sure someone enjoyed their relatively abstract and rough natures. 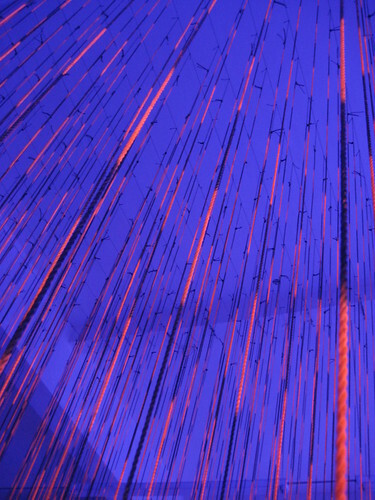 Neon glass pieces greet us upon our entering. 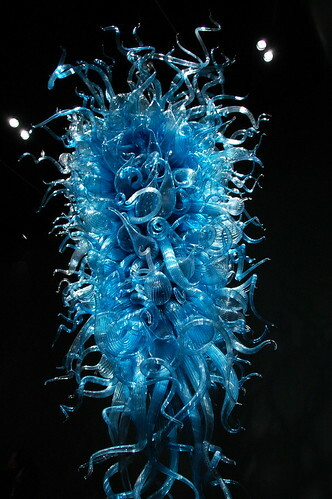 Chihuly’s “Persians” series. The work was great, but the descriptions were painful at best. 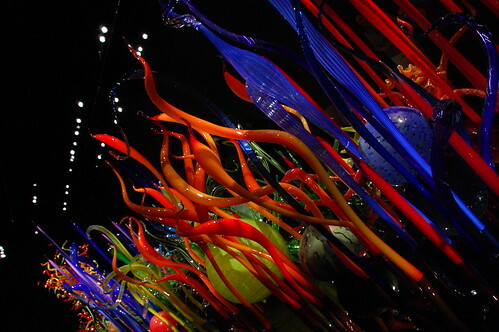 To loosely sum it up, the description of these pieces touched upon how the pieces seemed foreign and unique and therefore reminded him of foreign lands… and to him, foreign lands meant things like Asia, like Persia… and as a result, these were called “Persians.” Uhhh, no. No. A chorus of angels sings. Exploring the relationship between cold and still, hot and flowing (like magma). “Reeds” series. By this point I was no longer reading the inspirations, so I couldn’t tell you that part. 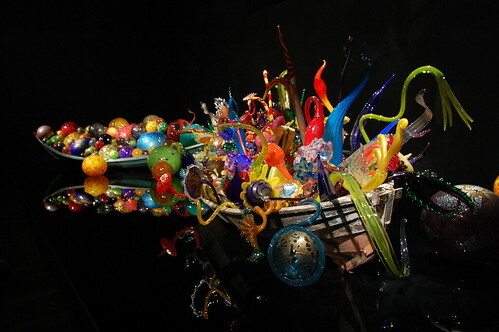 Two boats carrying a million glass pieces, floating on a sea of black. More from the “Chandeliers” series. 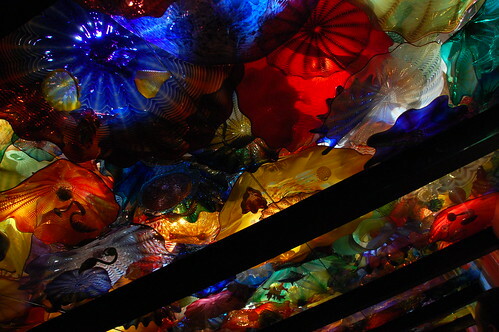 Nothing much here — just a ceiling of glass. 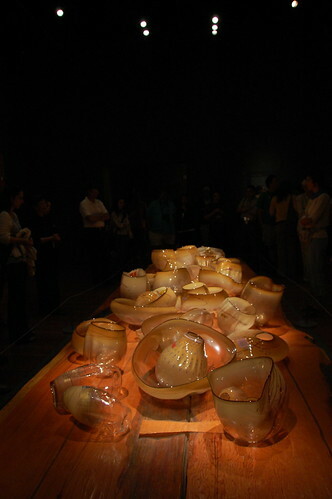 What was really cool about this all-white room were the rainbows cast on the walls from the array of glasswork. An assortment of odd freaks and fancies. The first of many San Francisco art posts to come in this upcoming week! 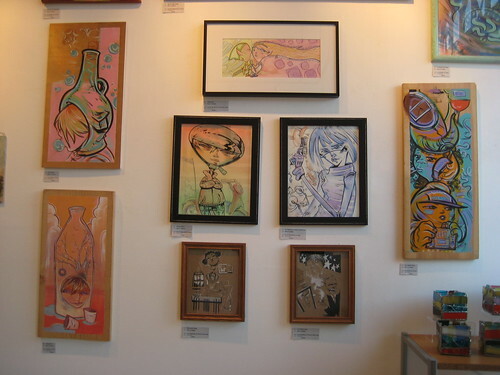 This is at the Artist Xchange in San Francisco’s Mission District (3169 16th St., San Francisco, CA, 94103). 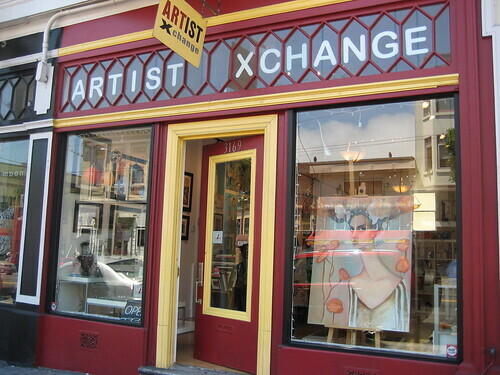 View more art on their website, artist-xchange.com, and if you’re an independent Bay Area musician, you can even submit your music to their listening station. Dave Crosland told us to stop by there explicitly, as many of his pieces are on display in their gallery right now. We didn’t refuse. 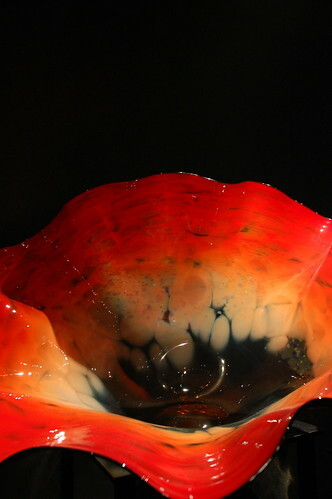 Here’s a quick look at what’s in store for you if you are to visit the small art boutique. More of Dave’s work at hiredmeat.com! 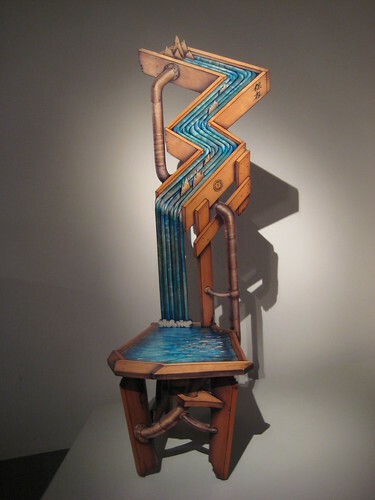 Other exhibiting artists for the month of June may include: Bryana Fleming, Dave Crosland, Daniel Cheek, Marilyn Jones, Enoc De La Rocha, Erin Mcelroy, Larissa Martin, Eugene R., Franz Schnaas, Joseph Szymanski, Ben Collison, Aindrila, Michael-Che` Swisher, Georgianne Fastaia, Brad Wright, Hang Nguyen, Hiroko Sakai, Sherry Holiday, JBalducci, MZZ T RZZ, Cameron Forsley, Liz Worthy, Kelcie Tinker, Hilary Williams, Cade Burkhammer, Michael A. Levin, Gems For Jewels, Matt Delight, MaryEllen Mahar, Francois Egron, Niana Liu, Pat Markle.